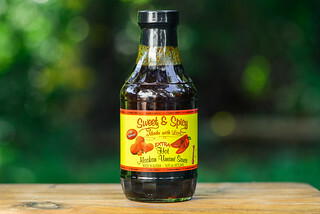 A standard mixture of barbecue flavors is taken down a notch with an artificial bacon undertone that clouds this sauce's potential. Back in college, when it was low cost beer or nothing, Yuengling was my go-to. I was never a fan of many of the other flavorless American standards, but Yuengling had some character that attracted me within the sea of its mostly watery brethren. The Yuengling brewery, the nation's oldest, got its start in 1829 by David Yuengling in Pottsville, PA. David's lager began being bottled under his son management, Frederick, in 1895. The brewery remains in the family to this day, and in 2014 they partnered with All-N-Food, LLC to develop a suite of barbecue and wing sauces using their ubiquitous beer. 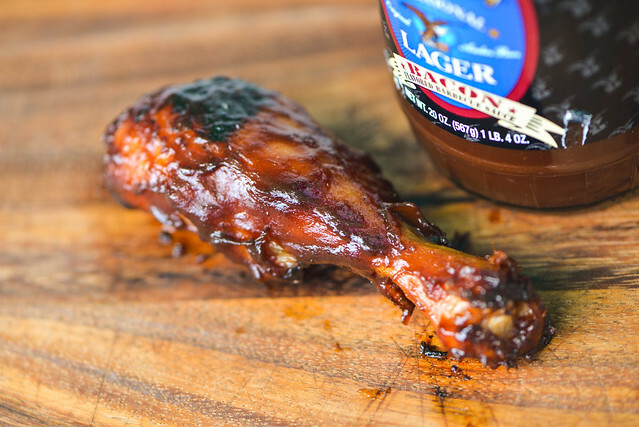 There are currently four different barbecue sauces in the Yuengling line-up. If you want bacon, you certainly get some in the aroma of this sauce. You would think the meaty, smoky smell of bacon would be a match made in heaven with barbecue sauce, but its presence creates an overall odd and confused impression. 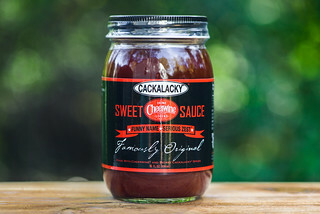 There's the standard barbecue sauce players—an acidic tomato base, light tangy, and molasses sweetness—but having a strong, somewhat artificial, presence of cooked bacon straight out of the jar makes it feel like something's not quite right. It is faintly like pig candy, but not in the same insanely appetizing way—maybe it's the missing visual of bacon that's throwing me off. 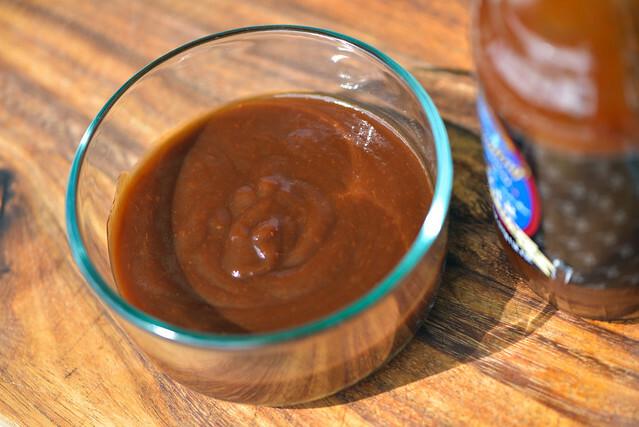 The dark, brownish maroon sauce sits north of the medium-thickness line. It's smooth and opaque, which makes it difficult to make out many spices. From a suspended spoon, it first falls quickly in a few big globs, then the remaining sauce very slowly moves to the edge of the spoon, releasing in one small drip, leaving a heavy layer of sauce left clinging. Following the smell, the taste is somewhat confounding. The first flavor is of unsweetened tomato that's heavy and acidic. Molasses begins to mix in, but with not much sweetness to it. A mellow vinegar arrives in the next wave and turns the sauce sour, and faint hints of onion and garlic follow. The whole time, there's a weird underpinning of fake bacon. I wouldn't call this the meaty, porky, smoky bacon we all know and love, but maybe more akin to veggie bacon, which my parents made us try a few times in our Kosher household, but quickly abandoned. There's no heat at all in the end, leaving the final aftertaste one of sour molasses with an artificial bacon. The sauce coated the leg evenly on brushing, but then became a little clumpy as the chicken sat over indirect heat. In never really baked down onto the meat, and brushed off easily when moving the chicken around. It then burnt off a bit over direct heat, where is also over caramelized, creating blackened portions of pure char. The odd flavor remained, but wasn't as off putting thanks to a little more sweetness coming into the mix. The overall flavor with still heavy on the molasses, with the bacon-y background. Even though I levitated toward Yuengling in college, I wouldn't say it was anywhere near my favorite beer then, and especially now. Still, I find myself getting it now and then and thinking, it's alright, but I'd rather be having something else. This is kind of the way I feel with this sauce, which is taken one step lower thanks to its fake bacon flavor. 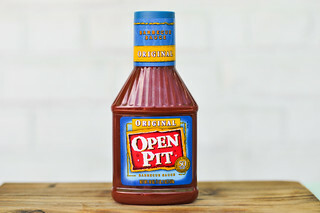 Sure, it's a barbecue sauce and it does the job, but there are so many more out there that do the job better. I personally wouldn't pick up the bacon flavor version again, but I do look forward to seeing if their other sauces fair better without that specific oddity that's clouding what might otherwise be a better middle-of-the-road sauce. 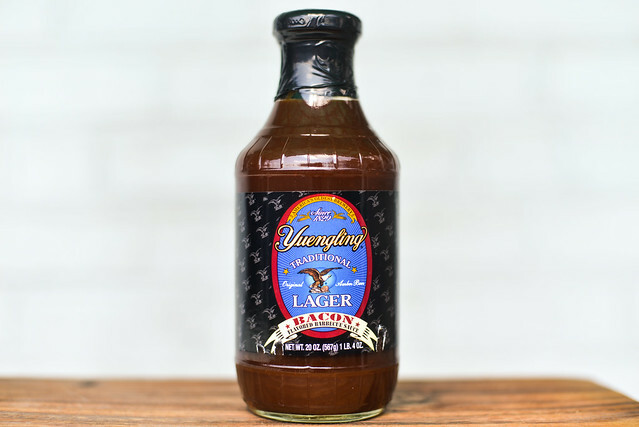 I drink a little Yuengling but it sounds like I needn't run out to the store and find some of their sauce. Thanks for the report. Looks like I'll be skipping this one. Thanks for the heads up.